Slovakia expelled a Russian diplomat for espionage work, the nation's prime minister told reporters Wednesday. Prime Minister Peter Pellegrini explained that gathered intelligence supported the decision. He said that the spy, in the country on a diplomatic visa, had been engaged "in intelligence activities against Slovakia and NATO." The unnamed Russian was declared persona non grata on Nov. 22, requiring his departure, and he left by the 24th. 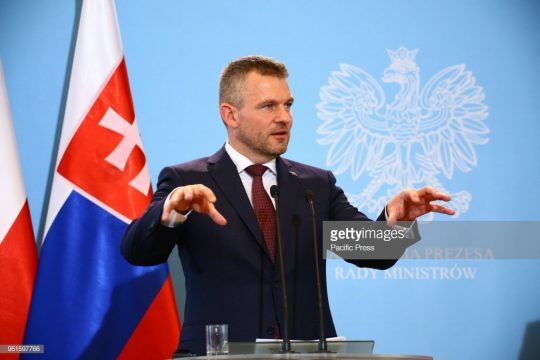 The Russian had been working in the Russian Embassy in Bratislava, Slovakia's capital, and Pellegrini said he violated the Vienna Convention on Diplomatic Relations. Russian intelligence operations in foreign countries is a well-known practice, and one more aggressively addressed by affected nations in recent months. In March, the United States expelled dozens of Russian diplomats and ordered the closing of a Russian consulate in Seattle. Special Counsel Robert Mueller secured indictments in July for twelve Russian agents relating to hacking and influencing the 2016 U.S. elections. The United Kingdom expelled 23 operatives. A dozen other EU states followed suit. The Netherlands expelled two Russian spies in March following reports of attempts to hack into the systems of laboratories for sensitive information. Russian Foreign Minister Sergey Lavrov later claimed the reports and arrests were just a "misunderstanding." Former Deputy Assistant Secretary of Defense Michael Carpenter described Slovakia's decision as particularly notable, since it took no action after Russian GRU agents reportedly poisoned a former Russian spy and his daughter in Salisbury, England. Pellegini confirmed Slovakia had informed its allies of the decision. Slovakia is an EU and NATO member but maintains close diplomatic and energy ties with Russia. This entry was posted in National Security and tagged European Union, Russia. Bookmark the permalink.